Preheat the oven to 375F. Butter two baking sheets. Place a piece of plastic wrap or waxed paper the size of phyllo sheets atop a flat work surface. Spread out one sheet of phyllo dough on the plastic wrap, while keeping the unused phyllo sheets covered with a damp cup towel. Quickly brush the sheet with butter and sprinkle with 2 teaspoons of sugar. Place another sheet of phyllo atop. Repeat brushing with butter and sprinkling with sugar. Continue with remaining 3 sheets of phyllo, ending with butter and sugar sprinkled atop the top sheet of phyllo. Once all the sheets of phyllo are stacked, one on top of the other, cut through them using a sharp knife to cut the sheet into 2" squares. There will be about 35 squares. Using a metal spatula transfer the phyllo squares onto the two baking sheets, leaving about ½ inch between the squares. Transfer the baking sheet to the oven and bake the phyllo squares for about 5 minutes until dark golden brown. Remove from oven, loosen the phyllo squares from the baking sheet using a flat metal spatula, and allow to cool. Combine the ricotta and the honey in the work bowl of a food processor fitted with a metal blade and process until very smooth. 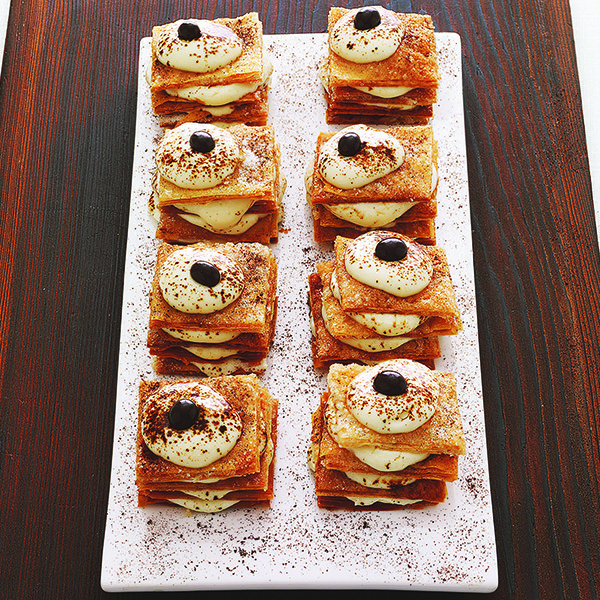 To construct the Napoleons, place one phyllo square on a dessert plate, top with a teaspoon of the ricotta filling, and then sprinkle with a pinch of ground espresso. Rrepeat until there are four layers of dough topped with ricotta filling each sprinkled with espresso dust. Garnish with the chocolate-covered espresso beans and a couple of leaves of mint.